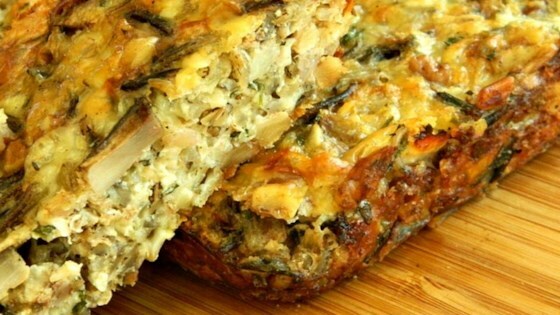 "This is a gluten-free favorite at retreats year around. Try this warm with onion gravy, mashed rutabaga, and sauteed green beans." Preheat oven to 375 degrees F (190 degrees C). Butter a 9x5-inch loaf pan. Put walnuts and pecans in a resealable bag and seal; crush nuts using a rolling pin. Heat olive oil in a skillet over medium heat; cook and stir onion and garlic in the hot oil until onion is translucent, about 3 minutes. Add mushrooms, marjoram, sage, and thyme; cook and stir until mushrooms are golden, about 5 minutes. Transfer mushroom mixture to a large bowl. Stir crushed walnut mixture, Swiss cheese, wild rice, cottage cheese, eggs, parsley, salt, and pepper into mushroom mixture until evenly mixed. Pour mixture into the prepared loaf pan. Bake in the preheated oven until loaf is golden brown, about 1 hour. Let loaf cool in pan for about 20 minutes before inverting pan and removing loaf. See how to make a hearty vegan main dish.